Whilst I accept completely that the fishing related stuff you might see on Facebook, Instagram and a few forums is of course not all that’s going on within bass lure fishing here in the UK and Ireland, I would suggest that what you are seeing is at least a snapshot. I don’t know how you look at this stuff, or indeed if you do - and nope, I can’t pretend that photos of bass lying on tape measures or on the sand or rocks are ever going to do it for me - but surely you have noticed a big increase in the number of reports and photos that revolve around lure fishing at night for bass? And I find this fascinating, indeed I bet if you took a snapshot of the same social media platforms say five years ago you wouldn’t be seeing anywhere near as much night based lure fishing going on. On the one hand I love how heading out when it’s pitch black to fish with lures has become so normal and accepted for so many of us now, but on the other hand I am continuously interested in how bass fishing especially is developing and changing for any number of different reasons. You may not be interested in this yourself, but unless I am learning all the time with my fishing and my life that revolves around fishing then my interest would soon wane. Okay, so those of you here who have either been lure fishing since before you were actually born and/or have been night lure fishing for bass since time immemorial will no doubt wonder what on earth I am banging on about. 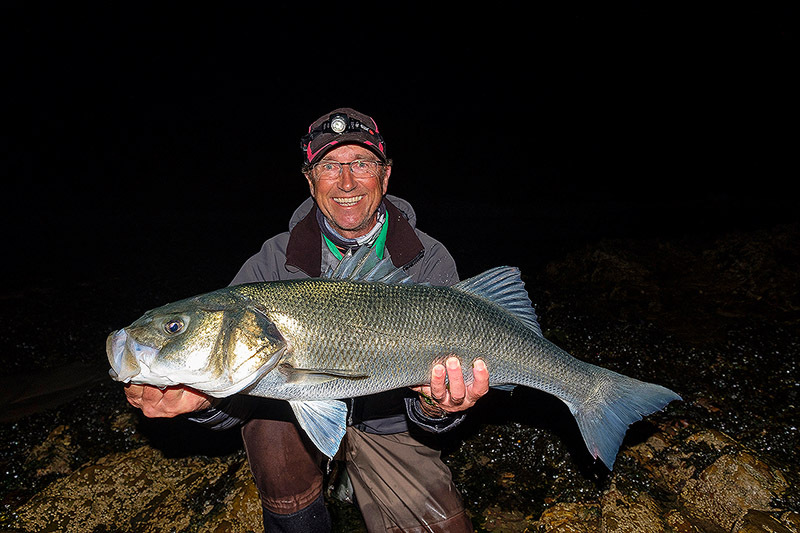 For those of us who haven’t been fishing with lures for years and years and who didn’t realise you could seriously catch bass at night on lures (bait, surely? ), are you in a similar boat to me here in that heading out lure fishing when regular people are tucked up in bed has become so ingrained in your bass fishing these days that you can’t help but think back to the days when you weren’t night fishing and wonder what you could have been catching? Take the last couple of nights as a very simple and accessible example. I can’t recall such a prolonged calm spell of weather around here in SE Cornwall for years - the sea is flat and the water is about as clear as it can ever get, indeed it’s every single thing that we don’t want for daylight bass fishing out on the coast. Sure you can go and go and go and because it’s fishing and there are no rules as such you might well end up with a few fish eventually, but now wait until it’s dark and it is so often a completely different story…………. It hasn’t been epic, but we’ve had a few bass over the last couple of nights in conditions that I simply would not be fishing around here during daylight hours - and on Monday night I hooked what was without doubt the best bass I have (briefly) connected with this year, but the sodding fish came off the needlefish. You know when you hit a fish and it hits back properly hard? It’s a completely different feeling if you ask me, and that’s what happened for a brief moment late on Monday night - or was it actually the early hours of Tuesday morning? Night fishing at this time of year means a lot less sleep, and you either deal with it or you don’t! I firmly believe that because we can’t see what’s going on there’s a kind of disconnect in our head with committing to the fact that bass are perfectly able to locate lures in the pitch black - and until you disprove this to yourself by heading out there and catching bass at night on lures then I reckon night lure fishing will remain that thing which works for other anglers but isn’t working for you for whatever reason. How do I know this? Because I have been in that exact position. But it does work, and as I said earlier, I find it so interesting how fishing our lures at night has become the norm for so many of us more now when not very long ago I wonder how many of us just didn’t quite believe that was possible. Adapt or die? Okay, not quite as extreme as that, but you get my drift…………..